The NFL draft airs tonite on ESPN and nobody has a clue who the first pick will be and if he will even have the opportunity to play this season. The courts will decide what happens with the lockout…. Anyways, not to carry on, but I had an assignment a few weeks back from ESPN. Bill Parcells was in Orlando at Full Center University and was taping a show called “Bill Parcells Draft Confidential”, where the old ballcoach rated the current draftees and his guesses on their draft order. I was hired to shoot behind the scenes for distribution and marketing. Everyone was fun to hang with and I have to say, shooting for ESPN is always a good time! Anyways, not to carry on, but I had an assignment a few weeks back from ESPN. Bill Parcells was in Orlando at Full Center University and was recording a show called “Bill Parcells Draft Confidential”, where the old ballcoach rated the current draftees and his guesses on their draft order. I was hired to shoot behind the scenes for distribution and marketing. Everyone was fun to hang with and I have to say, shooting for ESPN is always a good time! The Orlando City Lions of the United Soccer League have officially begun their season and I think this is just what the Orlando market needs to draw new blood to the sport. The Lions are in their first season here and have assembled a pretty good team to boot! I had the opportunity to shoot the match against visiting Puerto Rico and the fan support and game action was better than expected. Look for a feature in the next issue of Orlando Sports Mag! Family took a trip to Chimney Rock, North Carolina a few weeks back. Rainy weather with the temps in the high 30’s. Not exactly what I had planned for Spring Break weather but you know what, my phone didn’t work there and that was alright with me. My boys, ages 6 and 7, regularly climb at the indoor rock wall in Longwood and get a kick out of it. 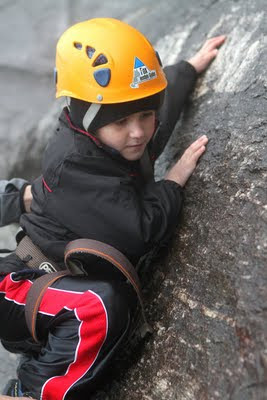 We decided that for this trip we would try to climb real rocks….game on!! 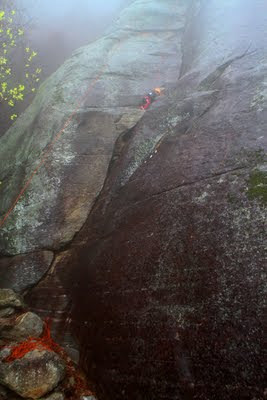 We hired Fox Mountain Guides and were on our way. Blaze and Zane had a blast climbing, even though it was so foggy and we were so high up that they couldn’t exactly see where it was that they were climbing to….